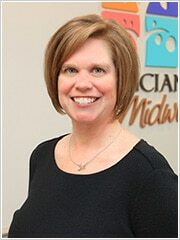 Courtney is a Certified Nurse-Midwife, born and raised in Memphis, TN. She earned her Master’s of Science in Nursing with a Certificate in Nurse-Midwifery at Yale University and her Bachelor of Arts in American Studies from Smith College. Her clinical experiences have included non-profit clinics and Level II hospitals. Her passion for women’s health runs deep, and she values education and empowerment in both prenatal care and gynecology. Professional interests include adolescent health care and family planning/spacing. She seeks to partner with women and families to ensure a satisfying health care experience. When she is not in the office, she loves hanging out with her husband and 3 young daughters. They often travel, sail and hike together, and they play a lot of board games. Courtney is active at her church. She enjoys reading, music, college basketball and baseball. Go Red Sox! If you’re a Yankees fan, she promises to be nice to you anyway.